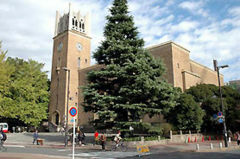 Waseda University (早稲田大学, Waseda daigaku), often abbreviated to Sōdai (早大, Sōdai), is one of the top universities in Japan. Founded in 1882 by Okuma Shigenobu (大隈 重信), two-time Prime Minister of Japan, as Tokyo Senmon Gakko (College), the institution was renamed "Waseda University" in 1902. Waseda is known for its liberal climate symbolized by its motto Independence of Learning. Though Waseda receives some financing from the government and is subject to some government control, it is a private university and has often served as a counterpart to the government-supported Tokyo University. Waseda was the first Japanese university to open its doors to students from China, Korea, and other Asian countries, many of whom became influential political and intellectual leaders in the modernization of Asia and participated in the creation of the present world order. 3 Origin of the name "Waseda University"
Six postwar Prime Ministers have been Waseda alumni: Tanzan Ishibashi (1956–1957), Noboru Takeshita (1987–1989), Toshiki Kaifu (1989–1991), Keizo Obuchi (1998–2000), Yoshiro Mori (2000–2001), and Yasuo Fukuda (2007–2008). Waseda's literature program is also well known, and counts Haruki Murakami and Tawara Machi among its graduates. A number of corporate leaders and public figures are also Waseda graduates, including Li Dazhao, co-founder of the Chinese Communist Party; Masaru Ibuka, co-founder of Sony; Lee Kun-hee, chairman of Samsung; and Takeo Fukui, CEO of Honda. Waseda University was founded in 1882 as Tokyo Senmon Gakko (College) by scholar and Meiji-era politician Okuma Shigenobu ( 大隈 重信), the 8th (June 30, 1898 – November 8, 1898) and 17th (April 16, 1914 – October 9, 1916) Prime Minister of Japan. Ōkuma was an early advocate of Western science and culture in Japan. As a youth, Ōkuma studied foreign languages, politics, and science under the Dutch missionary Guido Verbeck at the Yougakusho (School for Western Studies) in Nagasaki. Impressed by Verbeck's encyclopedic knowledge, Ōkuma realized the importance of a school to train future Japanese leaders. 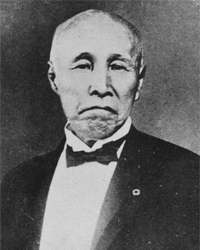 Ōkuma Shigenobu represented a political faction outside of the two major groups, Satsuma and Choshu (Meiji origaki), who dominated the Japanese government. In 1882, when the political establishment under Hirobumi Ito was supporting the adoption of a constitution modeled after the Prussian constitution, Ōkuma organized a new political party to promote a British-style constitution. Tokyo Senmon Gakko (College), founded the same year, embodied a spirit of opposition to the political establishment that has characterized it until the present. Waseda has served as a counterpart to the government-sponsored Tokyo University. Journalists, politicians and intellectuals who graduated from Waseda have often opposed the political establishment and represented a liberal point of view. During the build-up to militarism that preceded Japan's involvement in World War II, a number of Waseda graduates spoke out openly against the policies of the Tojo government. Waseda is known for its liberal climate symbolized by its motto, Independence of Learning. A number of Japan's business and political leaders, including six Prime Ministers, were educated at Waseda. Under the old Japanese system of higher education, the school began as a college with three departments: Political Science and Economics, Law, and Physical Science. An English language course was established at the same time for the students of all the departments. Three years later, the Department of Physical Science was closed because there were so few applicants. A Department of Science and Engineering was established in 1908. A Department of Literature was established in 1890, a Department of Education in 1903, and a Department of Commerce in 1904. Much of the campus was destroyed in the firebombings of Tokyo during World War II, but the university was rebuilt and reopened by 1949. It has grown to become a comprehensive university with two senior high schools and a School of Art and Architecture. Origin of the name "Waseda University"
Waseda University started its life as Tokyo Senmon Gakko (College) on October 21, 1882. Before the name Waseda was selected, it was known variously as 'Waseda Gakko' for the location of the founder's villa in Waseda village or "Totsuka Gakko" for the school's location in Totsuka village respectively. Around 1892, people began to call it "Waseda Gakko." It was renamed Waseda University on September 2, 1902, when it acquired the official status of a university. The founder of the university, Okuma Shigenobu wanted to create an academic cap so distinctive that any student wearing it would immediately be identified as being from Waseda University. The chief tailor of the Takashimaya Department Store (高島屋), Yahichiro, was commissioned to perform this task and produced a satisfactory design in just three days. Each square cap is stamped on the inside with the student's name, the course he is attending, the school seal and the legend, "We confirm that this is a student of Waseda." The cap serves both as a form of identification and as a status symbol. The cap, with its gold-braided badge, is registered as a trademark. On October 21, 2007, Waseda University celebrated the 125th anniversary of its founding by Shigenobu Okuma. Okuma often spoke of the "125 years of life" theory, saying that a man could live a natural lifespan of 125 years if he took proper care of his health. According to physiologists, every animal has the capacity to live five times as long as its growth period. Since a man is said to require about 25 years to become fully mature, it follows that he can live up to 125 years of age. This theory was often referred to in the media at the time. Shigenobu Okuma organized his second cabinet at the age of 77 and lived to be 83 years old. He often remarked, "I wish I had understood this '125 years of life' theory 30 years earlier." In commemorative events relating to Waseda University and Shigenobu Okuma, the number 125 is accorded special significance. The tower of Okuma Auditorium, completed on the University's 45th anniversary, is 125 shaku (approx. 38 meters) high. In 1963, events were held to mark the 125th anniversary of Okuma's birth. Waseda University's main campus is located in the Nishi-Waseda district of Shinjuku, though Waseda is generally associated with the Yamanote Line station, Takadanobaba Station. Apart from the main campus in Shinjuku, other campuses are located in Chuo and Nishitōkyō of Tokyo, Tokorozawa-shi and Honjo-shi of Saitama, and Kitakyushu-shi of Fukuoka Prefecture. Nishi-waseda Campus was renamed Waseda Campus in Spring 2008. The Okuma Memorial Hall, contemporary building by architect SATÔ Kôichi, 1878-1941. Soon after Shigenobu Okuma's death on 10 January, 1922, the planning of memorials dedicated to him commenced. The first decision was to construct a large auditorium, something Okuma had always dreamed of. The three-story main auditorium seats 1,435, and secondary auditorium located underground can accommodate 382 people. A seven-story clock tower, 125 shaku (approx 38 meters) high, stands to the left of the auditorium. The tower, at is associated with Okuma’s "life of 125 years" theory. The bells at the top of the tower, manufactured by the MacLean Company in Baltimore, Maryland, were transported through the Panama Canal. It was the first time that four bells, large and small, had been used in Japan. The bells, which ring six times a day, produce the same harmony for the city of Waseda as Westminster Abbey does for London. Oval-shaped transom windows on the roof of the auditorium represent the sun, moon and nine planets of our solar system, and symbolize the "harmony of the universe," both inside and outside the Auditorium. Due to the Great Kanto Earthquake, the Auditorium was opened about five years behind schedule, on October 20, 1927. In April, 1999, the Auditorium was designated as the first, and the Old Library the second, of the "Tokyo Metropolitan Historic Buildings," under the Tokyo Metropolitan Landscape Regulations, which aim to preserve buildings representative of Tokyo's history and culture. The Auditorium was designated as one of the Important Cultural Assets of Japan by the Ministry of Education in 2007. The Waseda University Library, designed by Tachu Naito, Kenji Imai and Kin-ichi Kiriyama, was completed in 1925. This five-story building, with a total area of 1,195 tubo (about 3,944 square meters), was used initially as the University Library. The reading room was housed in a separate 2-story building, and had a seating capacity of 500. One of the prominent libraries established at the end of the Taisho period (July 30, 1912 to December 25, 1926), it has remained a symbol of Waseda University, along with the Okuma Auditorium and the Theatre Museum. The Old Library and the administration building were extended in 1934 and 1955 respectively. The Old Library relinquished its role after the New Central Library (located where the Abe Stadium used to be) was completed in 1990. It now serves as Sanae Takata Memorial Research Library, the University Archives, and Yaichi Aizu Museum. Sanae Takata Memorial Research Library, named after former President Sanae Takata, was launched in 1994. Historical and cultural materials on Waseda University are exhibited in the University Archives, where the Ōkuma Memorial Room showcases materials related to Shigenobu Ōkuma. Yaichi Aizu Memorial Museum was founded in 1998. 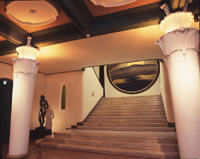 In the front hall, visitors are greeted by the masterpiece "Meian" (1927). It is painted on the world's largest hand-made washi (Japanese paper), 4.45 meters in diameter and weighing about 12 kilograms, manufactured by Heisaburo Iwano, the founder of the Echizen paper works in Imadachi-cho, Fukui Prefecture. The masterpiece was donated by Taikan Yokoyama ( 横山大観) and Kanzan Shimomura ( 下村観山), two artists who represented the modern Japanese style of painting, whp painted it at the request fo President Sanae Takata. The library possesses a unique collection which, unlike many of its counterparts, survived the Bombing of Tokyo in World War II and is an important resource in the study of pre-war Japanese history and literature. In April 1999, the Old Library was designated as one of the first of the "Tokyo Metropolitan Historic Buildings” along with the Okuma Auditorium. The Waseda Theatre Museum, formally opened in 1928, functions as both a repository and exhibition space, housing nearly 37,000 items and 100,000 volumes. It fulfilled the desire of Professor Tsubouchi to build a museum dedicated to theatre arts, and commemorates his accomplishments, among them a 40-volume translation of the works of Shakespeare that Tsubouchi finished in 1928, the year of his 70th birthday. Modeled after the Fortune Theatre of London, the museum approximates it in both exterior construction and interior design. 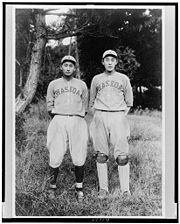 Two Waseda University baseball players from 1921. The rivalry between Waseda and Keio University ( 慶應義塾大学) is highlighted by the Sōkeisen in the Tokyo Big6 Baseball League. The baseball series held twice a year, in the spring and autumn, at Meiji-Jingu Stadium, is considered one of the most important competitions by both student bodies. The Waseda University Baseball Club has the highest percentage of wins in the Big6 league, but has 37 league championships, making it second to Hosei University (法政大学). Waseda University football team won the Emperor's Cup, in 1964 and 1967. Waseda University Rugby Football Club currently is the reigning university rugby union champion in Japan, reaching the university championships 28 times, and winning 14 times. Its two biggest rivals are Keio University and Meiji University （明治大学）. Tanzan Ishibashi (1956–1957); Noboru Takeshita (1987–1989);Toshiki Kaifu (1989–1991); Keizo Obuchi (1998–2000);Yoshiro Mori (2000–2001);Yasuo Fukuda (2007–2008). Masaru Ibuka, co-founder of Sony, recipient of the Order of Culture; Lee Byung-chul+; Founder of Samsung; Shin Kyuk-Ho, founder and Chairman of Lotte Group; Yoshiaki Tsutsumi, founder of Seibu Railway. Haruki Murakami, novelist, translator, writer, recipient of Franz Kafka Prize; Kitahara Hakushu+ (author). ↑ Tokio Kimura, Waga Waseda: Okuma Shigenobu to sono kengaku seishin (Tokyo: Kobunsha, 1997), 74, 123. ↑ Okushima and Nakamura (eds. ), 25. ↑ Okushima and Nakamura (eds. ), 37. Kimura, Tokio. Waga Waseda: Okuma Shigenobu to sono kengaku seishin. Tokyo: Kobunsha, 1997. ISBN 4770409591. Kiyomiya, Katsuyuki. Translated into English by Ian Ruxton. ULTIMATE CRUSH: Waseda University Rugby, Leadership and Building the Strongest Winning Team in Japan (September 2006). Retrieved October 18, 2008. ISBN 978-1430303213. Okushima, Takayasu, and Naoyoshi Nakamura (eds.). Tōmonno gunzo. Tokyo: Waseda daigaku shuppanbu, 1992. This page was last modified on 11 August 2013, at 21:39.